There will be a forecourt closure at Bristol Airport Thursday 26th May between 2000 and 0300. The temporary bus stop for the Air Decker Service will be located along North Side Road, just before the forecourt entry road. Members of Bristol Airport will be located on the Terminal Forecourt and North Side Road to direct customers and offer assistance. This entry was posted in Uncategorized on May 25, 2016 by Connor Flavell. Due to roadworks on the A38 the Air Decker Service is experiencing up to 30 minute delays. Please allow extra time for your journey. This entry was posted in Uncategorized on May 20, 2016 by Connor Flavell. This entry was posted in Uncategorized on May 16, 2016 by Victoria. From May 9th 2016 Upper Bristol Road between the junction with Windsor Bridge and the junction with Marlborough Lane will closed for 4 weeks for resurfacing works. The road closure will be in place between 7pm & 7am each day, for 4 weeks. Bath to Bristol Airport: The service will follow the normal route until to the Westgate Buildings stop, then divert via Charles Street, Midland Bridge road and the Lower Bristol Road to rejoin the normal route at Windsor Bridge. Bristol Airport to Bath: The service will be follow the normal route until Windsor Bridge, then divert via the Lower Bristol Road, Pines Way, Midland Bridge Road and Charles Street to rejoin the normal route at James Street West. This means that during the hours between 7pm & 7am we will be unable to serve the following stops – Monmouth Place, Nile Street, Comfortable Place & Park Lane (in both directions). This entry was posted in Uncategorized on May 3, 2016 by Connor Flavell. The normally green A4 Air Decker Service buses have a white one among them for the coming weeks. 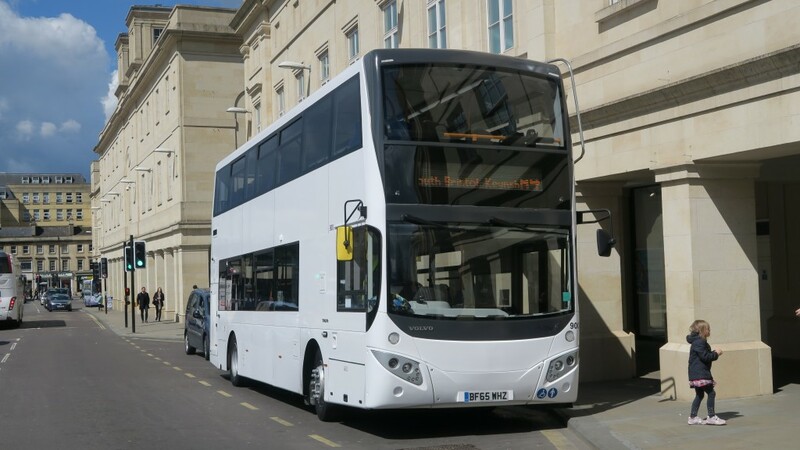 Bath Bus Company has had a white bus made available to them by Volvo that features a Euro 6 clean, green, low emission engine that is expected to use less fuel than other buses operating the Air Decker service. The bus is being trialled for 2 weeks to determine its effectiveness, and if successful could influence future orders for Bath Bus Company & its Air Decker Service. 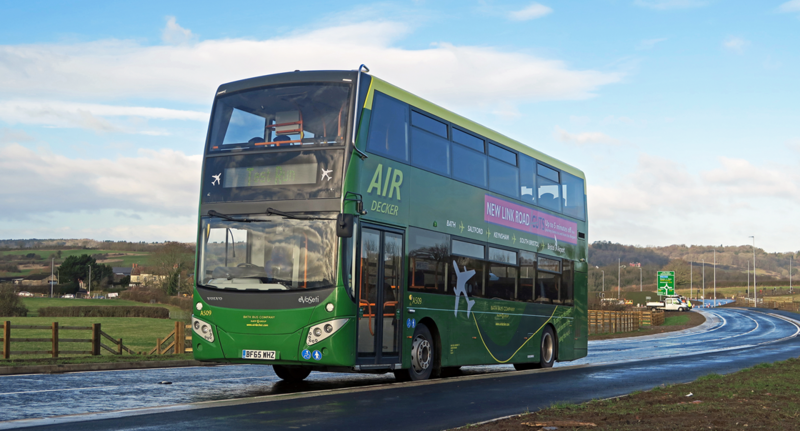 The Air Decker Service has become known for its distinctive green buses, so drivers operating the white bus have been asked to look carefully for passengers when approaching stops, as not everyone will expect a white bus rather than the usual green Air Deckers.